The new activity at the Sohae launch site comes days after Trump-Kim summit. President Donald Trump said Wednesday that he would be "very, very disappointed" if it is determined that North Korea is in fact rebuilding its missile launch facility as was disclosed in commercial satellite imagery that was made public Tuesday by a Washington think tank. "It's too early to see. We'll see," Trump told reporters in the Oval Office on Wednesday. "We have to solve a problem. The relationship is good. I would be very disappointed if that were happening." 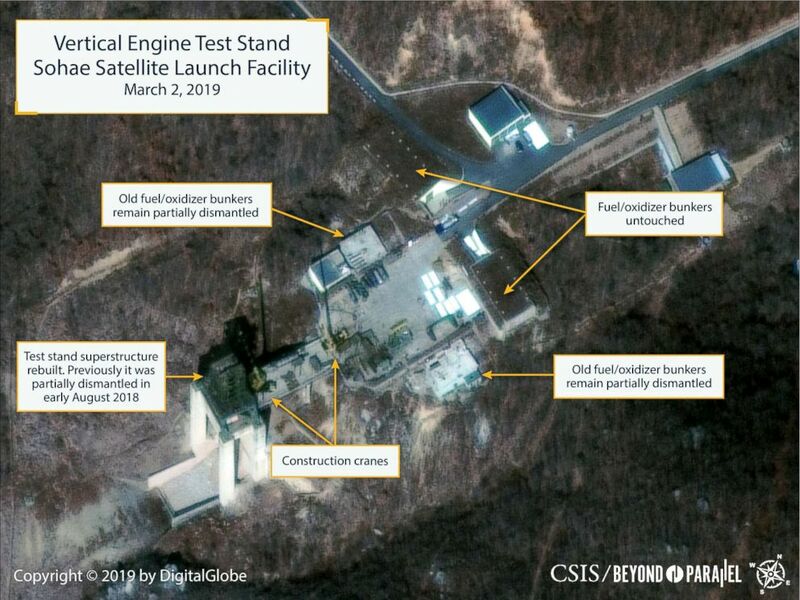 The satellite images, taken on March 2, 2019, were acquired by the Center for Strategic and International Studies' (CSIS) Beyond Parallel and show new activity at the Sohae (Tongchang-ri) launch facility located in the northwestern part of North Korea. The images showed what appears to be rapid rebuilding at a site that has been inactive since last August. "It's a very early report," Trump said. "We're the ones that put that out. "But I would be very, very disappointed in Chairman Kim but I don't think I will be, but we'll see what happens," he continued, expressing optimism that Kim will ultimately be shown to be trustworthy. The development comes days after Trump's summit with North Korean leader Kim Jong Un that did not result in a denuclearlization agreement between the two countries. 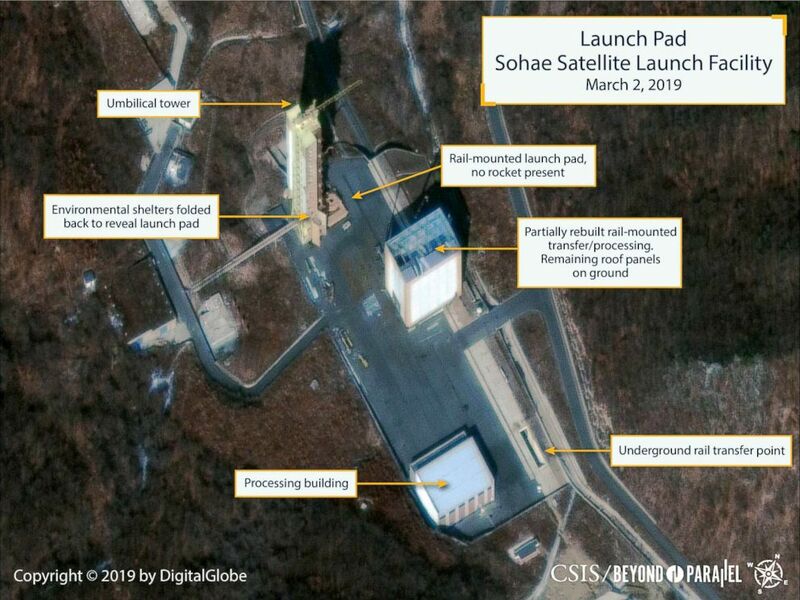 (CSIS via Digital Gobe) Sohae Launch Facility in North Korea, March 2, 2019. The images showed activity to rebuild the launch stand at the location that is the country's main site for long-range satellite launches and missile-engine testing. The site has not been used for the launch of North Korea's intercontinental ballistic missiles, which are fired from mobile launchers. However, U.S. officials have said that the civilian satellite launches are a cover for military intercontinental ballistic missile tests since the technologies are so similar. Activity at the site includes two construction cranes, as well as several vehicles and supplies laying on the ground next to the vertical engine test stand. The satellite photos also showed activity at the launch pad's rail-mounted rocket transfer structure. The covers that typically shroud the site's umbilical launch tower have now been opened to show the launch pad itself. The renewed activity at the launch site was detected two days after the Trump-Kim summit in Hanoi, Vietnam, that failed to reach an agreement to eliminate North Korea's nuclear weapons program. The Sohae facility has been inactive since Aug. 2018, when North Korea seemed to be following through with a commitment they made to Trump at the Singapore summit that Kim would dismantle a launch facility. 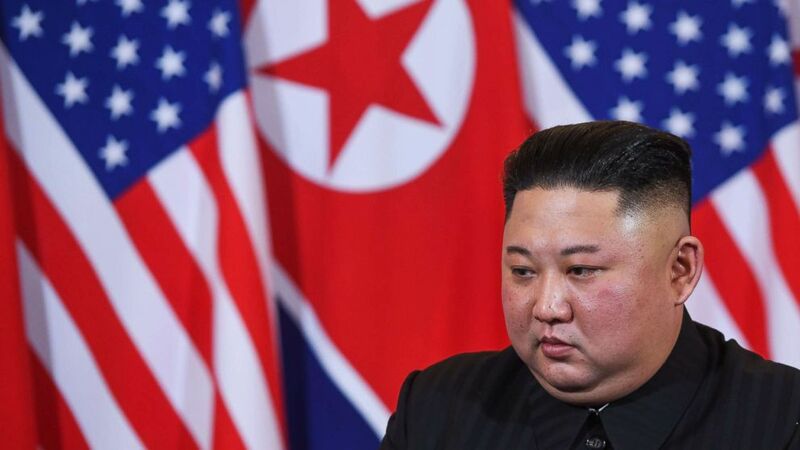 (AFP/Getty Images) North Korea's leader Kim Jong Un listens to President Donald Trump during a meeting at the Sofitel Legend Metropole hotel in Hanoi, Feb. 27, 2019. CSIS analysts believe the current activity "is deliberate and purposeful" to show North Korea's resolve in the wake of the Hanoi meeting. Though no agreement was reached in Hanoi, Trump told reporters that Kim had committed to continue not to conduct ballistic missile or nuclear tests, as he had following the Singapore summit.